Former lawyer Nicole Fitzhenry-Dawes should be focusing on planning her wedding and a friend’s baby shower, as well as running her maple syrup farm. Instead, her “former” profession won’t let her go. Her maid of honor, Elise Scott, is suspended from her job as a Fair Haven police officer for investigating a case she shouldn’t have been anywhere near, endangering not only her career but also her relationship with a fellow officer. Nicole can’t believe Elise would have risked so much without a good reason. When Nicole finds out that the reason involves Elise’s children, she ends up defending a man she isn’t convinced is innocent. 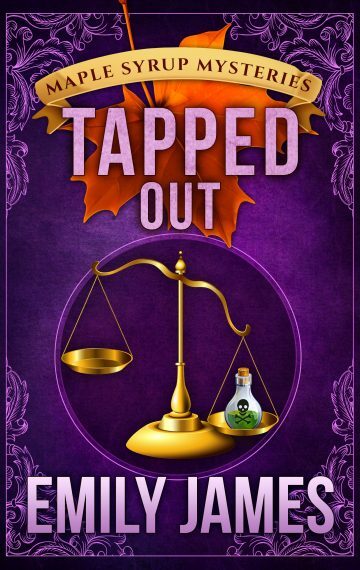 Tapped Out is the seventh book in Emily James’ Maple Syrup Mysteries. The series is full of small-town settings, quirky characters, and a touch of romance!